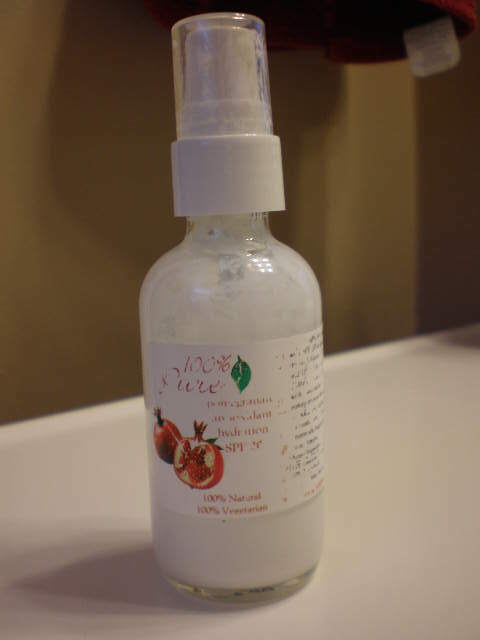 The label is a little worn off but this is a bottle of Organic Pomegranate Antioxidant Hydration SPF 20 by 100% Pure. 100% Pure products are made without synthetic chemicals, preservatives, or artificial anything. The products are made with food-grade ingredients and they never test on animals or use any animal ingredients (other than cruelty-free honey). Read their About Page for more detailed information. I found out about 100% Pure last fall in the Kind Life forums. There’s a great thread over there on cruelty-free, all natural beauty products. I was looking for an all-natural, vegetarian face lotion for day-time use and was actually having a difficult time finding one with SPF. I’m not sure if it’s the nature of sunscreen that makes it difficult to use in all-natural products or what. Maybe it’s difficult to make sunscreen without chemicals? 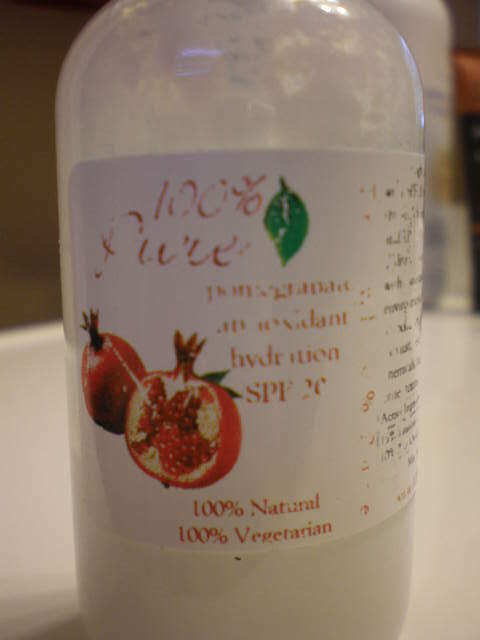 Anyway I was very excited to find the pomegranate lotion at 100% Pure that included SPF 20. I ordered it from Drugstore.com. You can also buy it directly from their website. The price is the same either way – $26 for 2 ounces. At first I wasn’t sure I liked the consistency of the lotion. It has a different feel to it, probably because it doesn’t have any chemicals or fillers! But it wasn’t long before I was used to it, and now I really, really like it. It’s not greasy at all and goes on smooth. I think it’s helped my skin glow a little more. 🙂 I’ve been using this bottle for at least 4 months now, maybe more. I can’t quite remember when I bought it. It does cost a little more than drugstore brands, but I think it’s worth it. Two ounces doesn’t seem like much, but it’s lasted me awhile. Since I liked this lotion so much, now I’m excited to try other products from 100% Pure! I really want to try the Organic Coffee Bean Eye Cream and the Fruit-Pigmented Cosmetics. Has anyone else tried other 100% Pure products? If so, can you recommend anything? If not, what other natural face care products do you like? Note: I was not paid in any way, shape or form by 100% Pure to write this post. The company did not send me a free bottle of lotion to try. I bought this with my own funds and wanted to share it with you all! If I am ever paid by a company to review a product I will be sure to say so up front.